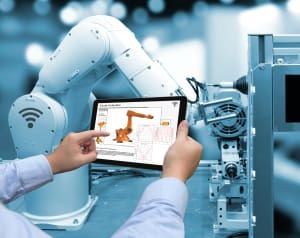 A physics-based digital twin may make it possible to realize many of the benefits of a traditional digital twin, without some of the drawbacks. To avoid the challenges of expensive sensors, data collection and black-box behavioural algorithms. For conceptual design before any physical prototype has been constructed. To test integration in a virtual commissioning phase and ironing out issues otherwise found on the production floor. Dr. Chad Schmitke holds a Ph.D. in Systems Design Engineering from the University of Waterloo, where he serves as an adjunct professor. His research focuses on the symbolic modeling of multibody mechatronic systems. Before joining Maplesoft Chad worked as Chief Developer at MotionPro, and at the Canadian Space Agency as a post-doctoral fellow, developing tools for modeling robotic manipulators. Graham Jackson is an Engineering Specialist at Maplesoft. A nanotechnology engineer by education, he’s got a broad background in new technologies across domains. Graham has spent most of his career communicating technical concepts to those outside of the R&D department, and building support for system-level approaches to modeling and simulation. Your attendance at this webinar is in partnership with Maplesoft. To watch, please complete the form on this page.